Ace of Shades by Amanda Foody. Harlequin Teen, 2018. Hardcover. 416 pages. I ended up liking Ace of Shades a lot more than I expected to. I read Amanda Foody's debut, Daughter of the Burning City, and I was incredibly underwhelmed, which was really disappointing because I had such high hopes for it. 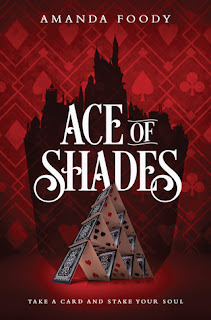 Despite this, I still found myself really intrigued by the synopsis of Ace of Shades, so I thought I would give a shot anyway, and in my opinion it was a definite improvement from her previous book! This story takes place in the New Reynes, more commonly known as the City of Sin. Within this city is a large divide between the North Side and the South Side, with the North being the more downtrodden area that is run by various crown gangs and the South side being the more 'reputable' area. Foody really seems to have taken her time in creating her world and giving it an extremely solid foundation. I would have liked slightly more detail regarding the larger aspect of the world, as well as how regular citizens lived, but overall I really enjoyed her worldbuilding. One area that confused me about Foody's world, however, was exactly what time period this book was meant to take place in. I couldn't tell if it was just a made-up fantasy world with its own sort of time-period, or if it was meant to be a real-world time? There were modern elements such as cars, electricity, and other modern items, but the way that the clothing, mannerisms, and societal norms were described made it feel more early nineteenth/late eighteenth century. This doesn't really affect the story itself, but it was something that I kept questioning in the back of my mind and did leave me feeling somewhat uncertain throughout the book. The main characters that we follow are Enne Salta and Levi Glaisyer. The supporting characters in this book were also very interesting, but didn't play quite as big roles as I would have liked, so I won't say all too much about them here. Enne travels to New Reynes in order to track down her missing mother, Lourdes Alfero, and is shocked by the loose morals that seem to be so prevalent. Enne herself is rather snobbish, pretentious, and has extremely strong manners, so it was entertaining to watch the culture shock that she experienced in this new, more uninhibited city. Once in New Reynes, she slowly uncovers more and more secrets about herself and her mother, and by the end of the book she must come to terms with who she really is. I found Enne's character development to be really well-done and well-paced. There was a very obvious transition as Enne goes from someone who refuses to do thing that aren't 'appropriate' to someone who realizes the world isn't quite as black and white as she thinks. Levi is from New Reynes itself and lives on the North Side where he is the Iron Lord of the Irons crime gang. His gang is currently struggling with money and pressures are coming in on all sides demanding money, putting Levi in some dangerous situations. Enne stumbles into the company of Levi and he becomes her guide, and well... without spoiling anything, we'll just say that things start to take off at that point. Levi is tough, as a crime lord must be, but he knows how to wield his power in an effective manner that earns him respect. I really liked Levi's character, but I will say that it seemed as if Foody sort of talked up his danger and intimidation level. Levi certainly seemed like a guy I wouldn't want to mess with, but he hardly seemed as scary as everyone made him sound. I would call him a softer edition of Kaz Brekker. Despite this, I still really loved his character and the bisexual representation and the diverse representation. I was really pleased with the pacing of this book. The story isn't overly fast-paced, but it isn't slow either. There seemed to be a wonderful balance of action and events that pushed the plot forward in addition to plenty of character development and focus on the more thematic elements of the story. "I found this missy asking about the whiteboots and Pup"
"There's a missy here to see you"
"The missy in question sat on the couch, her back straight as a billiard rod, her legs resting to the side with one ankle tucked.."
At first I thought a 'missy' meant a young girl, but then it was used in different ways and I was really unsure. I did a count on my Kindle and found fifty-one usages of missy, which is about fifty too many. Also, Foody's made-up curse words were... not good. I am all for some good in-universe curse words that fantasy likes to do, but it has to be done really well, and this just wasn't. This might not be a big deal to many people, but it just really annoyed me. 'Muck' is one of the most common ones used, but it sounded so horrible because it really just sounds like a censored version of f*ck, which made it sound dumb. It drove me crazy. It was used in the same way as f*ck in most places, but there were a few where it sounded more like the word muck itself: "And walking straight into some muck." So how is this word supposed to be used? It confused me about as much as 'missy' confused me. I know this is just a minor gripe, but it was something that bothered me and sort of pulled me out of the story. Overall, I still really enjoyed Ace of Shades and ended up giving it four stars! This is a fun, entertaining book with solid characters and an interesting storyline.